The next meeting will be on April 18th at 1:00 pm in the Library. Last meeting the membership voted to establish a permanent website. We no longer operate on borrowed webspace. This will benefit the club in several ways. With a permanent home the website should not be changing it's internet address. Also, we can now have more than one person helping to maintain the site. Many thanks to George Carlson for his selfless devotion to this club and for lending us the space for our website these many years. The following is a list of items that members would like to see and a list that members have volunteered to present. Bill Sperry, will work out a schedule for these. This tape is very well done and covers many important areas of tool grinding. The author discusses many types of tool posts, i.e. He also discusses tool composition, various tool angles, bench grinders, grinding wheel compositions, shapes and grades, hand stones. Enclosed with the tape is an interesting grinding table drawing for controlling angles of grinding tool bits. an interesting item was the water pans used both for cooling work and catching chips and sparks. The video and accompanying audio is well done. All machinists, both professional and amateur have faced the problem of buying a lathe. On the surface, it looks like this would be easy. You simply buy the lathe that you want, right? The problem is, the lathe that you want before you buy it may not be the lathe you want after you buy it. I faced this problem about a year ago, and I'm glad that I spent a couple of weeks arguing with myself about the requirements for my lathe. First, I made a list of the items that I planned to build. By far, the majority of these items would fit in a 6" x 6" x 6" breadbox with room to spare. I determined that about 80% of my lathe work would be 1 inch in diameter or smaller. It was possible that some projects may require diameters larger than 9" (a common lathe swing) however, I figured that any big items could be contracted out to a "real" machine shop. Likewise, some projects may require lengths longer than about 20" (a common distance between lathe centers) but again, if I need that length I'll just contract the work to a "real" shop. The bottom line was a 9" x 20" lathe was probably good enough for what I expected to build. Next, I scavenged catalogs and brochures on as many small lathes as I could find. I also asked various lathe owners a lot of dumb questions. I looked at everything from a 3-1/2" Sherline lathe to a 13" Nova lathe. My small shop space and the requirement that I be able to move the lathe by myself narrowed my search down to bench lathes with a maximum 12" swing over the bed that weigh less than about 400 pounds. 2. Minimum Swing Over Bed: 9"
3. Minimum Hole Diameter Through Headstock Spindle: 1"
4. Minimum Swing Over Cross Slide: 5"
5. Minimum Distance Between Centers: 20"
Most of the above items such as voltage, swing, price, etc are obvious or self- explanatory. However, some require a more detailed explanation. For instance item 3, the "Minimum Hole Diameter Through the Headstock" allows round stock up to 1 inch (probably 80% of my work) to be fed through the headstock for machining without having to support the other end in the tailstock. 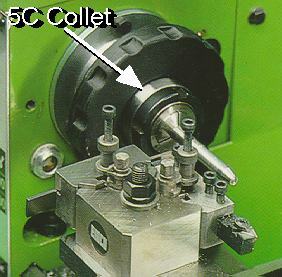 This not only shortens the lathe setup time, it allows small rods to be faced easily. Item 7, the lower end of the "Minimum/Maximum Lathe Weight" requirement was set at 200 lbs because the stiffness of the lathe bed affects the accuracy of the cut under a heavy load. In general, the heavier the bed the better the accuracy. Item 8, the lower end of the "Minimum/Maximum Spindle Speed Range" was set at 100 RPM because I'm not very good (that's an extreme understatement) at threading. I want a very slow speed so that I have a chance to stop the cut at the right point. The upper end of the speed range was set to allow for grinding and polishing operations. These requirements narrowed my search down to a half dozen lathes. The three top contenders were the 9" x 20" Jet (although its hole through the headstock spindle was only 25/32" and its lowest speed was 130 RPM), the 11" x 20" Standard (although its price was $7,800) and the EMCO Maier Maximat 11" (which fulfilled all of my requirements). At this point, my choice was obvious. I bought the EMCO Maximat 11". 2. Swing Over Bed: 11"
3. Swing Over Cross Slide: 6.7"
4. Through Hole Diameter: 1.4"
5. Distance Between Centers: 25.6"
7. Lathe Weight: 380 lbs. After owning this lathe for a year, I am extremely happy with it. Its rigidity and accuracy are even better than I expected. I have even machined extremely hard, case hardened steel with excellent results. As explained above, most of my lathe work involves shafts and screws that are less than 1 inch in diameter, so the 1.4 inch through hole works well. 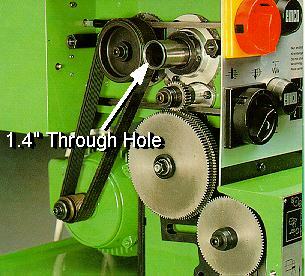 In addition, this large through hole is designed to accept 5C collets, which makes this lathe even more versatile. 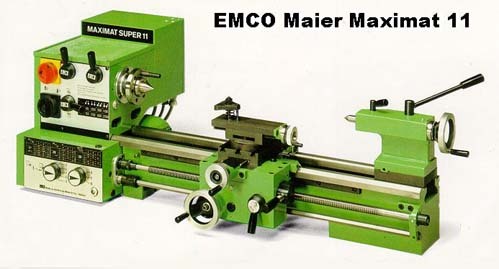 For anyone looking for a small lathe, I would definitely recommend the EMCO Maier Maximat 11". The above selection process is a reasonable example of the steps required to select a lathe. Your requirements may be completely different than mine, however your decision method will probably be similar.